The recent update by Imangi Studios; the guys behind temple run 2 actually prompted me to write this short review. Temple run 2 is hands down the best free endless runner game now at the Google play store. The improved graphics, improved challenges, new obstacles, bigger monkey, new environments and better functionally makes it better than its predecessor (temple run) and could also be termed a perfect sequel. With over a 100 million downloads, millions of google +1 and thousands of positive reviews on the official Google play store link, you can simply term it “the best” endless-running game of this era. The only downside of this sequel is the availability of “in-app purchases” that could significantly diminish competition, some low-end devices do experience frequent lags with this version as opposed to the predecessor. The whole idea behind this game assumes you are in possession of an idol that’s been stolen from an ancient temple, which has angered a murderous monster monkey that wants to get it back. Temple run 2 is easier when compared to its predecessor, the vastly improved graphics, brilliant colors, detailed environment and elaborate maps are chiefly contributing to its popularity. The game’s landscape has so much improved to feature; waterfalls, new zipwire and mine cart sections, this didn’t in any way impact negatively on the overall performance of the game. The controls is maintained in both versions; swipe left and right to make turns, swipe up and down to avoid various obstacles along the route, tilt to control the mine carts as well as pick up power-ups. Coins and Gems: These are introduced by the developers as the common currency used throughout the gameplay, you can unlock characters, upgrade abilities with coins or buy restarts with gems. In-Game Store: Temple run 2 is a freemium game and so features in-app purchases without any form of annoying adverts, unlike most other freemium games that requires you spend before completing a level or getting a high score, temple run 2 doesn’t. The in-game store section allows you to purchase coins and gems depending on your personal need. You aren’t forced to visit this section except you aren’t interested in devoting a lot of time to the game. 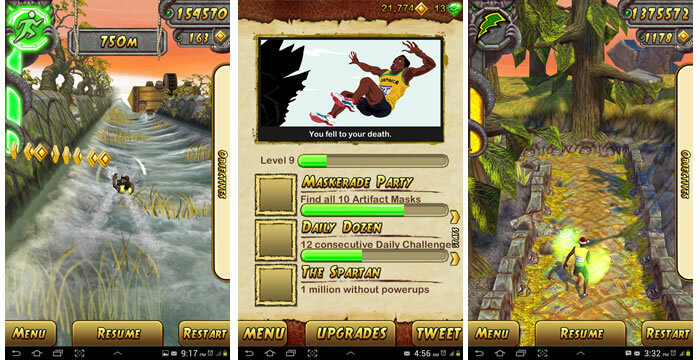 Challenges: In temple run 2, you are given regular daily and weekly challenges that aids your game level progression. Cons: Lags in most low-end devices, the presence of In-app purchases makes it less a competitive game. Download Temple run 2 on Google play store.